What, exactly, is it about boats? What is it that causes some of us to feel an inexorable urge to destroy, create, modify, and improve an ever-increasing number of old boats? For me, it seems to stem from a continuing urge to improve upon past experiences, increase overall knowledge, and try out new ideas and concepts. For each time I complete a project, there's always something that makes me say, "Next time, I'd love to try such-and-such...". Besides, I love working on boats--even when I hate it. Upon reflection, even the worst jobs involved in restoring or recreating an old boat always seem more fun than most other pursuits. Call me a glutton for punishment, but for me, projects like the ones I've been involved in are my preferred diversion, because I can't always be sailing and cruising. If you're not familiar with my previous efforts restoring another Pearson Triton, please click on the link to our sister site in the menu to the left. This will bring you to my site covering the rebuilding--and continuing upgrades and maintenance--of our 1963 Pearson Triton, Glissando, as well as our ongoing cruising adventures aboard. I was so smitten by the design and sailing qualities of the Triton--and a similar Alberg-designed Ensign before--that I began thinking of the possibilities that could be presented should I come across another derelict Triton begging to be saved from the scrap heap. These thoughts led me down the road to where I am today: in possession of a desperately neglected Triton that would not interest many souls. In a whirlwind two-week period, I doubled my boat burden by purchasing this near-abandoned hulk and arranging for her transport from Massachusetts to my backyard in Maine. Read more about how I came across the project boat here. Creating a high-quality and finely crafted daysailor from the beautiful and well-heeled Triton hull was a dream of mine from early on. 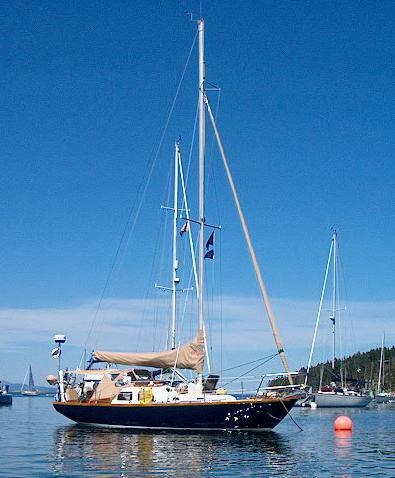 While the Triton, when properly refitted and updated, makes an excellent compact cruising yacht--and one capable of sailing wherever the spirit may move you--its relatively small size and classic hull shape lends itself to prime daysailor potential. With the proliferation of cookie cutter, Clorox-bottle production boats in the 35-and-under class, the head-turning quotient of a beautiful, purpose-built, classically-styled day boat should be high. This is what I hope to achieve with this project. To read more about the conceptualization process and the daysailor specifications, please click below.